Abstract: Featured by the multiple ride modes, large wheels and triangular frame, Airwheel R8 electric mountain bike gives an unprecedented riding experience and more importantly, it is able to satisfy various traveling needs, making it is gaining popularity. With the aim to let more people embrace a free intelligent life, Airwheel has brought constant surprises to the public with its future-oriented products. Airwheel insists in innovation and lately, its new product- R8 has amazed the world with its awesomeness and humanized design. It is convenient and comfortable. Satisfying various traveling needs, R8 triangle frame electric bike is gaining in popularity. With three riding modes available, Airwheel R8 hybrid bike gives an unprecedented riding experience. Empowering users to switch freely among three riding modes, R8 gives users a more interesting riding experience. Under the man-powered mode, riders can enjoy the pleasure of pedaling and experience the delight of doing exercises. Under the electric mode, they can get an efficient and effortless ride. And under the power-assisted mode, they can get a brand new riding experience, with the electric power and man power interplaying to let them move faster and further. For riders given the right to choose from these three riding modes by riding R8, they can get a more pleasant riding experience. Combining three riding modes into one bike, the powerful R8 electric assist bike can better suit customers' needs. Rider-oriented, R8 is very convenient and comfortable. Letting customers bid farewell to clumsiness, R8 is light, as its triangular frame is made of aluminum alloy. 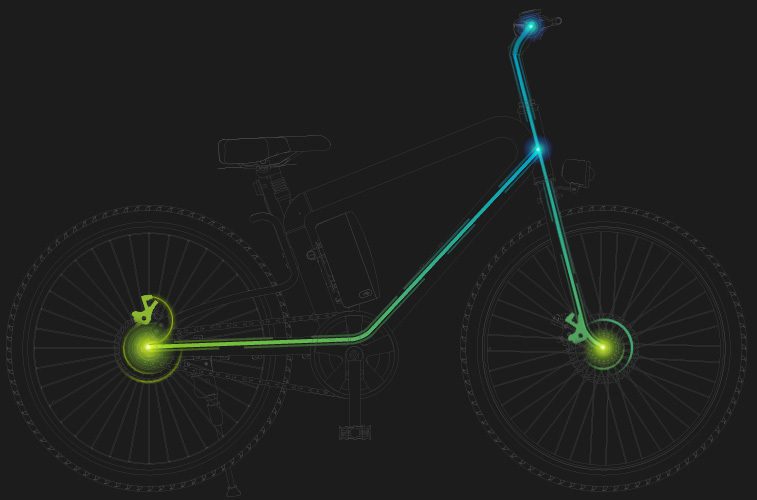 Moreover, guaranteeing a comfortable riding experience, R8 electric mountain bike pays attention to every detail. Its adjustable saddle improves the riding comfort and reduces fatigue during long time riding. The streamlined saddle made of high quality leather with good ventilation and resilience improves the riding comfort and reduces fatigue during long time riding. More considerately, there is a high efficient USB port on the battery which enables riders to charge their smart devices when needed. R8 can make seamless connection with other means of transport, facilitating people's travel greatly. To conclude, with high quality & reasonable price, Airwheel R8 lightweight trekking bike is gaining popularity.